To some, kombucha is a health supplement. For others, it’s just a tasty drink. To most, kombucha is … well … what is it? 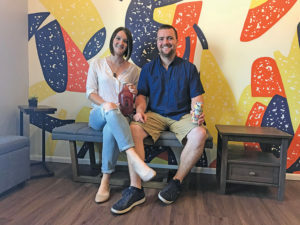 Upside Kombucha owners Tianna Valiani and Carson Racicot. Photo by Lyndsie Kiebert. Carson Racicot and Tianna Valiani are bringing kombucha to Sandpoint through their business, Upside Kombucha, and with it they’re bringing a new understanding about what exactly the fizzy concoction is. Put simply, Racicot said, it’s tea put through a process of fermentation. “Fermentation is a big word, but people are very familiar with its byproducts,” Racicot said, naming yogurt, cheese, wine, beer, distilled goods and sourdough as a few examples. He said kombucha is the product of a tea-specific nutrient exchange, where bacteria and yeast — in the form of a symbiotic culture (SCOBY) — eat the sugar in the tea and then excrete beneficial byproducts that could help with digestion and more. Racicot said research is still being done on the positive effects of the brew, but he said one thing is for sure: it’s tasty. The married couple grew up in the Seattle area, but knew they wanted to live more simply than the I-5 corridor would allow. What that would look like, they didn’t know. In the midst of and figuring it out, Racicot said he experienced some digestion troubles due to a thyroid issue. A friend suggested kombucha as a digestive aid, and after getting hooked on the stuff, Racicot started brewing his own. What better way to launch into a healthy lifestyle than to pack up and move to Bayview to work on a farm? The couple did just that, and worked for Racicot’s sister at Rugged Roots Farm. While there, the kombucha operation expanded into five-gallon batches in the back of a trailer — “because you have to start somewhere,” Racicot said with a laugh — and from there grew into 60 or 70 gallons a week when they began selling at the farmers’ markets in Sandpoint and Coeur d’Alene. Now, Racicot and Valiani are doing ‘booch full time at their tap house on Superior Street, serving up ice-cold pints or growlers to take home in flavors like lemon ginger, cranberry, apricot and more. “People here are so supportive of small businesses, so we’re excited,” Valiani said. Valiani said it’s an exciting time to be making kombucha because the industry is getting traction in the Pacific Northwest. Most importantly, she said, she’s proud of Upside’s product. Check out Upside Kombucha on Facebook, and visit their new tap house at 1333 Superior Street in Sandpoint Tuesday-Friday 11 a.m.-6 p.m.